Natural fiber-reinforced composites have the potential to replace synthetic composites, leading to less expensive, stronger and more environmentally-friendly materials. 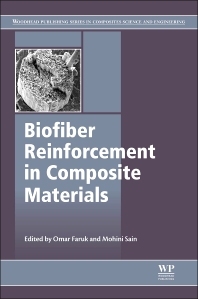 This book provides a detailed review on how a broad range of biofibers can be used as reinforcements in composites and assesses their overall performance. The book is divided into five major parts according to the origins of the different biofibers. Part I contains chapters on bast fibers, Part II; leaf fibers, Part III; seed fibers, Part IV; grass, reed and cane fibers, and finally Part V covers wood, cellulosic and other fibers including cellulosic nanofibers. Each chapter reviews a specific type of biofiber providing detailed information on the sources of each fiber, their cultivation, how to process and prepare them, and how to integrate them into composite materials. The chapters outline current and potential applications for each fiber and discuss their main strengths and weaknesses. The book is divided into five major parts according to the origins of the different biofibers - bast, leaf, seed; grass, reed and cane fibers, and finally wood, cellulosic and other fibers including cellulosic nanofibers. A comprehensive reference source that provides useful information for research and development managers working in industry, and also acts as a helpful resource for anyone undertaking academic research on polymer composites. Omar Faruk completed his B.S. and M.S. in Chemistry at the University of Chittagong, Bangladesh. With a DAAD (German Academic Exchange Service) scholarship, he joined at University of Kassel, Germany. He achieved his PhD in Mechanical Engineering at 2005. He worked at the Department of Forestry, Michigan State University, USA as a Visiting Research Associate from 2006 to 2009. Since 2010, he is working at the Centre for Biocomposites and Biomaterials Processing, University of Toronto, Canada. Mohini Sain is Professor and Director of the Centre for Biocomposites and Biomaterials Processing at the University of Toronto, and the Dean of the Faculty of Forestry.Sain was the recipient of one of the 2001 Industry-University Synergy Awards and the Society of Plastics Engineers award for Significant Industrial Contribution in 2002.